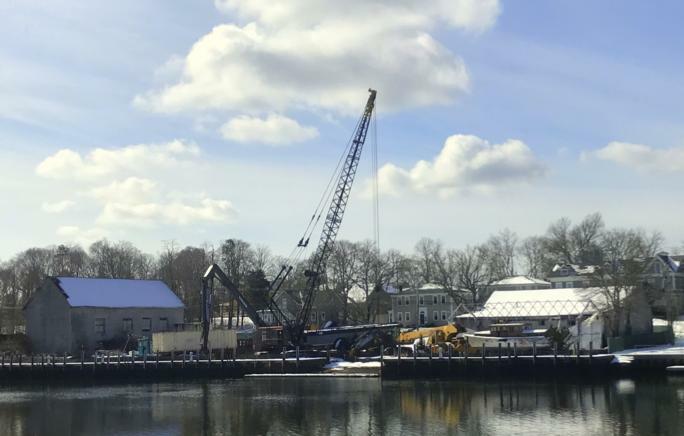 For over thirty years the skyline along the Wareham River, at the Narrows, in downtown Wareham, Massachusetts has been dominated by the presence of a large crane with over 100 feet of extended boom. The late 1960’s vintage Manitowoc crane had been the work horse of the riverfront boat yard. Three large wooden boat sheds occupied the property as well as an eclectic collection of maritime and amphibious equipment. The property had been shuttered for many years and there were no plans to restore any semblance of boat yard activities. With the underlying value of this spectacular waterfront property as the impetus, the owners asked us to provide an asbestos survey in anticipation of demolishing all buildings on site. We also collected and provided proper disposal for all fluids contained in the equipment on site such as motor oil, hydraulic oil and anti-freeze. Our master mechanic, Rene LeBlanc, crawled in and under each piece of equipment to drain and collect all fluids. We mobilized a varied fleet of our own equipment to the site to address the many specific challenges we faced. A Volvo EC480E High Reach excavator equipped with a rotating grapple was the ideal tool for demolition of the wooden boat sheds. This combination allowed us to carefully dismantle the buildings. Through this process we recovered all of the heavy timber that comprised the roof structures. A local sawmill had inspected the building in our early development of the project and agreed to buy them for an order that they were working on. The remainder of the wood debris went locally to Rochester C&D Recycling, where the material is processed to a specified bio-fuel project. The large cranes, forklifts and amphibious vehicles were all immobile and oversized to be transported from the site intact. We brought in another Volvo 480E conventional excavator equipped with a large Genesis rotating shear. The large, heavy and bulky equipment was processed into prepared scrap with the shear. To facilitate loading and clean-up, we mobilized a Sennebogen 825 material handler equipped with a magnet. This allowed us to continually pick up and load the processed scrap, especially small pieces that could become buried in the earth and cause trip hazards or puncture points for current and future vehicle tires. One of the dramatic moments on this job symbolized a rite of passage for construction equipment from one era to the next. The 50-year-old Manitowoc 3900 Crawler crane symbolized the high point of equipment technology in its time. We used the 480 E Volvo high reach with almost 100 feet of reach to safely and strategically dismantle the extended crane boom. The juxtaposition of technology from two eras was impressive. In the end, an incredible piece of land was revealed that had not seen the light of day for over thirty years. The owner now has multiple development possibilities available. Thanks to Hal Monsini for great project management. Sean Rae kept the crew equipped and debris removed from the site. Rene LeBlanc, Tom Reed and Jeff Connors all worked efficiently to get the project completed on schedule. Ed Ouellet, Shawn Clouten and Dave Oliveira did the heavy lifting on the ground.